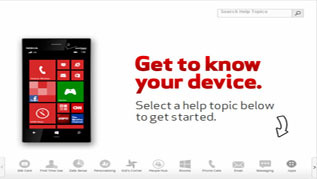 Find device-specific support and online tools for your Nokia Lumia 928. Discover nearby locations on your phone. Discover the most common ways to search the web on your Nokia Lumia 928. Discover how to use your voice to search the web on your phone. Data Sense is used to monitor data usage and set data limits, notifications and restrictions. If you're having other issues with your phone or device, visit our Troubleshooting Assistant. Data Sense is used to monitor and view data usage and set data limits, notifications and restrictions. If you're having other issues with your phone or device, visit our Troubleshooting Assistant. A visual guide for adding the Data Sense tile to the Start screen on your Nokia Lumia 928. Discover how to add a Facebook account on your Nokia Lumia 928. A visual walkthrough on how to post a Facebook status update on your Nokia Lumia 928. Learn how to access Kid's Corner on your Nokia Lumia 928. An interactive walkthrough on how to exit Kid's Corner on your Nokia Lumia 928. An interactive walkthrough on how to turn off Kid's Corner on your Nokia Lumia 928. Learn how to create a mix using Nokia MixRadio on your Nokia Lumia 928. Learn how to listen to music using Nokia MixRadio on your Nokia Lumia 928. Discover how to add a Twitter account on your Nokia Lumia 928. Learn how to tweet using Twitter® on your Nokia Lumia 928. Discover how to navigate to a location using VZ Navigator® on your Nokia Lumia 928. Learn how to change your preferences for VZ Navigator® on your Nokia Lumia 928. Learn how to find a place using VZ Navigator on your Nokia Lumia 928. Discover how to download an app from the Windows Store on your Nokia Lumia 928. Learn how to uninstall an app on your Nokia Lumia 928.